Generally, a WSN consists of a number of sensor network nodes and a gateway for the connection to the internet. The general deployment process of a WSN is as follows (see Figure 3-8): firstly, the sensor network nodes broadcast their status to the surroundings and receive status from other nodes to detect each other. Secondly, the sensor network nodes are organized into a connected network according to a certain topology (linear, star, tree, mesh, etc.). Finally, suitable paths are computed on the constructed network for transmitting the sensing data. The power of sensor network nodes is usually provided by batteries, so the transmission distance of WSN nodes is short. The transmission distance can be up to 800 to 1 000 meters in the open outdoor environment with line of sight. It will sharply decline in the case of a sheltered indoor environment to an estimated few meters. In order to expand the coverage of a network, the sensor network uses multi-hop transmission mode. That is to say the sensor network nodes are both transmitter and receiver. The first sensor network node, the source node, sends data to a nearby node for data transmission to the gateway. The nearby node forwards the data to one of its nearby nodes that are on the path towards the gateway. The forwarding is repeated until the data arrives at the gateway, the destination. The protocols and some implementation techniques of WSNs can be adapted to the mature architecture and technologies of wireless and wired computer networks. However, the features of WSNs are self-organization, self-adaption, limited nodes energy, and unstable transmission links. The positions of WSN nodes are random, and the nodes can be moved, sheltered and interfered with. The topology of mesh networks have great advantages in fl exibility and reliability compared with other network topologies. 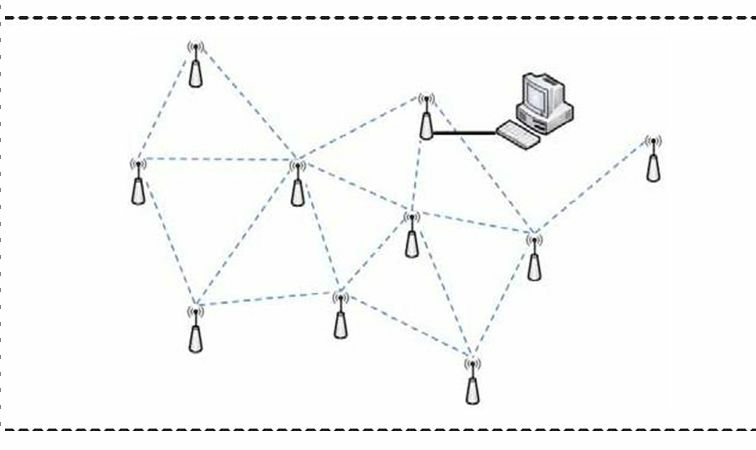 The self-organizing management approach of network nodes can greatly improve the robustness of the network, resulting in a smart mesh networking technology, as shown in Figure 3-9. In smart mesh ad hoc networking technology, the node fi rst monitors the neighbour nodes and measures the signal strength, and then it selects the appropriate neighbour node for time synchronization and sends a joining request. Then the neighbour node delivers the request to the gateway. The gateway receives the request and assigns network resources for the node. Based on the mesh network, the sensor network nodes can be assigned with two or more transmission paths to improve the reliability of network. The design of early sensor networks commonly used internal addresses to manage the sensor network nodes. The address length was relatively short and suitable for implementing in low-power embedded sensor network nodes. However, the internal address management method is not compatible with the IP method of the internet, which increased the difficulty of interacting between the sensor network nodes and the traditional IP network nodes. Therefore, there is a need to resolve the connectivity problem of WSN and IP network. One of the differences between WSNs and traditional wired networks is the instability of wire-less communication. In WSNs, the communication between nodes is susceptible to interference and occlusion, resulting in signal transmission failure. The traditional network is a stable wired network, which data will only be lost due to congestion. The principle of flow control is that the data sender adjusts the sending traffi c according to the loss situation of data transmission. When data loss occurs, the sender decreases the transmission rate. And when the data is not lost, the sender increases the transmission rate. Such flow control mechanisms are no longer suitable for WSNs , because the data loss in sensor networks is mostly caused by congestion, interference and occlusion. Purely decreasing the transmission rate cannot solve the problem, but only lowers the network performance. In order to solve the network performance degradation problem in unstable transmission conditions, adaptive flow control is proposed. Adaptive flow control checks the reason for packet loss and adjusts the transmission flow. Mean-while, according to the quality of the link and the number of transmission errors, the best transmission rate for the data transmission between nodes is prioritized to obtain good network stability while considering the transmission distance and throughput.